To enjoy all of the sights across East Africa, the expedition takes 8 weeks but a fortnight in Kenya allows you to see some of the most famous places. These include the Masai Mara National Reserve and Lake Victoria. This fortnight will also cross the Ugandan border to visit the famous giants that live in the remote reserves, the mountain gorillas. Before you move on to Tanzania and Zanzibar or a standalone trip on its own. You are guaranteed to fall in love with East Africa before you leave. Here are some of the sights you could enjoy in your fortnight in Kenya and Uganda. On a safari in Africa you might be keen to seen the gorillas, there’s much else to enjoy in Kenya before you cross over the border. Created due to tectonic plates moving in the earth’s crust and pushing the terrain upwards. The Great Rift Valley offers spectacular views of the many lakes below. At 8000 feet high, the vista is nothing short of dramatic and provides unparalleled views of the Kenyan countryside. The lakes below are home to a great number of protected wildlife species, including flamingo. These pink sculpted birds flock there in the thousands. WIth stork and even crocodile resting on the banks. There are eight major lakes in total, two of which are freshwater, the other six being alkaline. To get the best from the magnificent viewpoint, you will need binoculars, so make sure you have these to hand during your visit. If you are keen to see the gorillas, you will be thrilled to discover that the expedition moves over the border into Uganda. We travel through lush rainforests en route. After a brief overnight stop, the gateway to the Mountain Gorillas Reserve is reached. Only small groups can travel to see the gorillas at any one time. The expedition will remain in the reserve for a few days, giving everyone the chance to travel into the mountains. The rangers visit the gorillas daily, so have an idea where the gorillas are that day, but you should be prepared for a long trek. A waterproof covering, refreshments, long sleeved tops and trousers plus walking shoes are all essentials. You will be walking in dense rainforest so expect the terrain to be slippery and muddy in places. There are several families of gorillas and your guide will track a specific group. In some cases they may be near the edge of the reserve, taking only an hour or so to reach them. Sometimes they may be resting deep in the heart of the forest. They have been exposed to humans for a couple of years. They are frequently visited by the rangers, in order to make it safe for tourists to see them. You will be asked to keep a distance and to move slowly at all times once within sight of the great apes for everyone’s protection. You will be permitted to spend an hour with the gorillas once you reach them before turning back. The experience is exhilarating; being so close to the giants of the mountain in their own habitat is truly an honour. 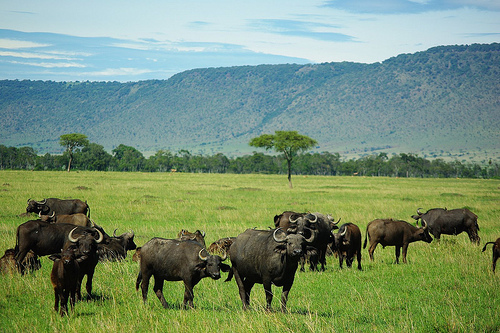 The Masai Mara is one of the quintessential images of Africa that most people hold. The spectacle of seeing the wide sweeping plains stretch out in front of you is something quite different. With beauty in the scrubby wilderness, there’s plenty of wildlife to see. Camping on the edge of the reserve and travelling overland by truck, you can expect to see the most fearsome predators on the planet. So-called because they are deemed to be the five most dangerous and largest African mammals; rhinoceros, buffalo, elephant, leopard and lions. All of these live on the Masai Mara and you may be lucky enough to sight them all. The leopard is particularly secretive and often there’s a greater chance to see them as twilight falls. With more than 95 special of animal and 570 recorded sightings of bird, the plains are home to a vast array of wildlife. Conservation measures are in place to help protect the landscape. This helps to prevent the Masai Mara becoming overcrowded with safaris and tourists. Although the landscape and animals are some of the undoubted highlights of a trip around Kenya, the city of Nairobi is a fascinating stop-off. 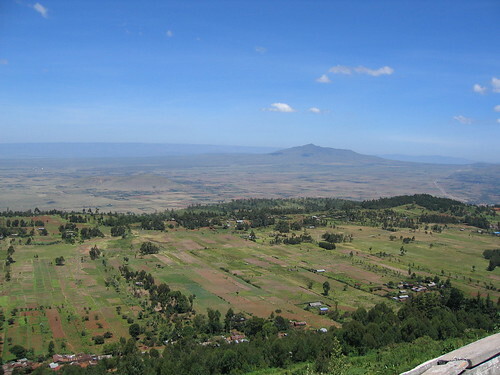 This is a great place to go to learn more about the country culture and the history of Kenya. With botanical gardens and two restaurants, the museum offers a lush green oasis of tranquility in the middle of the city’s crowds. In the city itself, there are lots of opportunities to shop for some Kenyan souvenirs. 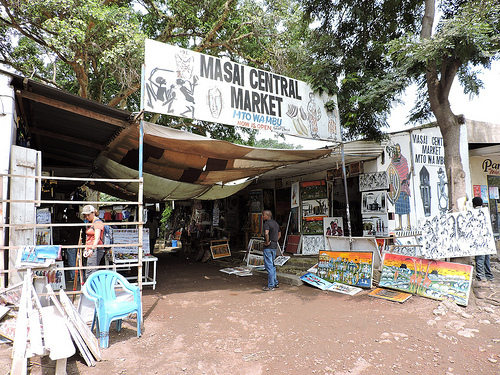 If your in town on a day when the Masai Market is being held, you will also find some great handicrafts for sale. Some of the treasures on offer include traditional Maasai beaded necklaces, wood carvings and shoes and decorations. These curios are made from recycled cans and flip flops; a truly unique gift. If you are keen to see more local crafts, the Kazuri Bead Factory and Pottery Centre is an alternative to the hectic outdoor markets. Employing more than 300 women from disadvantaged backgrounds, the centre sells ceramic beads and pottery as well as leather goods. You can watch the women at work and see how the pots get fired and glazed before browsing around the shop. Once you’ve reached the end of your journey, you will probably be keen to see more of this stunning continent..
With friendly people and adrenaline-pumping activities such as white water rafting, the memories will stay with you long after you leave.